With the new version of SP Flashtool ( SP_Flash_Tool_exe_Windows_v5.1416.00 ), I did it ! I also made files for SP Flashtool thanks to MTKDroidtool. For the backup, I stopped to FAT partition. You see, I have every files and the scatter is correct. I already tried to load manually but it doesnt work. 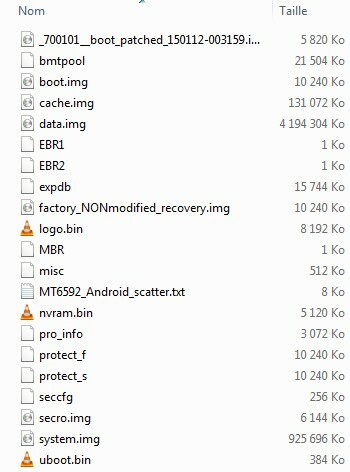 I see that recovery and ubootare also not selected. Hi, Thank you for your replying ! and " is_download: true" in green is well on "true". It should be loaded.. but it doesnt ! And " partition_size: 0x100000000 " is well equals to "4294967296 bytes" about the size of my data.img. Thank you very much. Maybe it's just a SPFlashTool problem... maybe I just need to wait that developers solve this problem. (01-18-2015, 10:51 AM)the_grinch Wrote: Hi, Thank you for your replying ! userdata should normally work. just used version 5.1343 (though its named userdata.img in gionee) and it loaded fine. try another version of SP flash tool and see if it helps. Yes ... it's really weird.. I'll try with older SP Flash tool versions. I take you in touch ! I tried with the 5.1343 version but it doesnt work ... same problem. The most strange is with my stock rom (userdata.img does 70MB), it works. Then I'm thinking it's because SP Flash Tool doesnt work with big length ( 0x 1 0000 0000 ) 9 digits against 8digits for every other partitions. When found, I'll post here the solution, otherwise if you have another idea, feel free to send it here!! (01-19-2015, 01:05 AM)the_grinch Wrote: Hi ! Oh, it's maybe a good idea to readback separately from the whole rom. I'm gonna try and I keep you in touch ! Just for me, the size written in the scatter file is correct and on Android, the size is well 4GB. maybe just a readback issue. it's very possible to readback one partiton at a time. 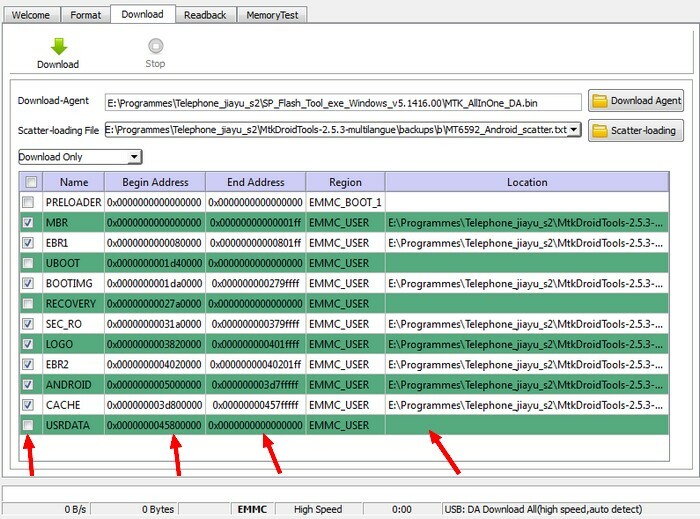 its for full dump you'll need mtk droid tools. you dont need mtk droid tools when dumping one file/partition at a time. see this guide @ https://forum.hovatek.com/thread-526.html . You can also see the video at that link. How to empty the scatter loading tab in spft?